i usually don't like to write posts on vegan/vegetarian only places (i mean, in a little over a year, i've only done one & two.) ... but the chicago diner is too good to go on neglected by this vegan (me). the chicago diner now has two locations -- logan square (far from me) and halsted street (the orig, close to me). my mom & i opted for the nearby halsted street location last weekend. back in 1983, the founders of the chicago diner aimed to "create an atmosphere as american as mini malls, decorating the place with vintage ads and neon lights & serving up heaping helpings of comfort food, but without the meat." and thankful we are to these brave, trailblazing souls. because today? today we have an incredible place for vegan eats. this was my mom's first time at the chicago diner ... and we decided to order a bunch of stuff and share it all. since i've been a few times, i knew a couple items we had to order, but we also tried some new dishes. 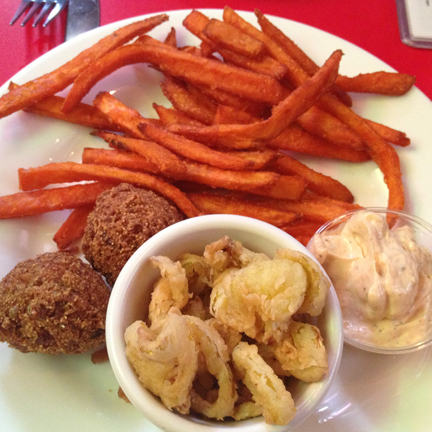 jalapeño corn fritters, french fried banana peppers, sweet potato fries & creole mustard. frying banana peppers is the most genius idea ever. sooo yum. i snarfed almost all of them before my mom could get a bite in. also, the jalapeño corn fritters were amazing. basically, a plate of fried deliciousness + a side of creaminess. corned beef seitan, grilled onions, peppers, sauerkraut, vegan thousand island & cheeze on marbled rye. in my opinion (and the opinion of vegetarian times magazine), this is why you come to the chicago diner. 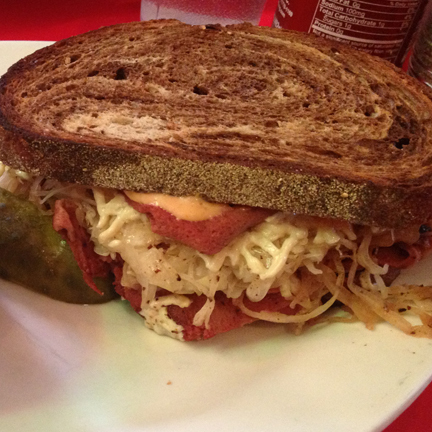 this sandwich is freaking awesome. i generally don't really like foods that are trying to be something else (and i also don't like foods that are trying to be meat, i mean - we are vegan. why would we want meat?) ... but this is just sooo tasty. salty, sour, crunchy bread = real sandwich perfection. hi, freaking awesome macaroni & cheeze that can accompany the freaking awesome reuben. 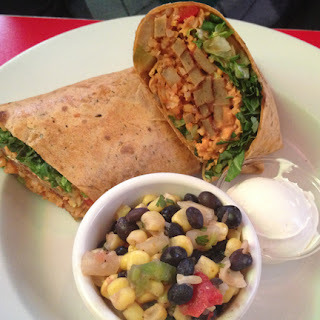 grilled seitan, onions & peppers, chipotle fire sauce, cheeze, lettuce, tomato & mexican rice in a tomato tortilla w/ sour cream & black bean corn salad. 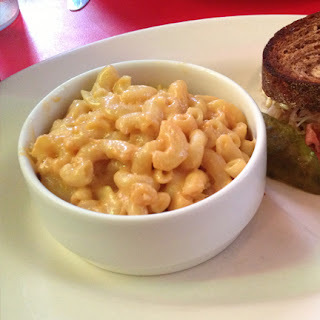 the chicago diner is truly a must eat for vegans & vegetarians (oh, and regular old meat eaters, too!) who live in or are visiting chicago. it's mind-blowingly-amazing. get there, stat. The Chicago Diner is one of the best vegan place and people love to come here. I saw a lot of reviews about it and love to get here for the great vegan food. From BBQ on Main I come to know about this place for the first time and your review about it is so good to try this place.